Bumblebees buzz in middle C to make flowers release their pollen. Bumblebees have a unique ability to make a buzzing sound that opens up flowers, National Geographic wrote this week. Bumblebees use something called buzz pollination to get their mitts on pollen in hard-to-reach flowers, such as cranberry and blueberry plants. That buzzing sound happens to be in the tone of middle C.
“It’s the ‘hey’ in ‘Hey Jude,’ and it causes the flower to explosively release pollen,” Denise Ellsworth, an entomologist at Ohio State University, told National Geographic. Unfortunately for humanity, bumblebees don’t use this ability to grab hard-to-reach nectar to make more delicious honey. While all bees make some variant of honey, only honeybees make the good-tasting stuff. Because only a queen bumblebee is expected to make it through the winter — she hibernates — they only make enough honey to sustain themselves paycheck to paycheck, as it were. Meanwhile, Rangel told National Geographic that honeybees make extra honey because “they live in places where there are seasons.” They use this honey to make sure the entire colony survives through the winter. Still, just because bumblebees do not make honey does not mean that they are worthless. According to Rangel, native pollinators, which include bumblebees, honeybees, and other insects such as butterflies, help produce a third of the food that the world eats via their pollination efforts. This is a $15 billion annual value in the U.S., according to National Geographic. Globally, this pollination is worth $200 billion annually. 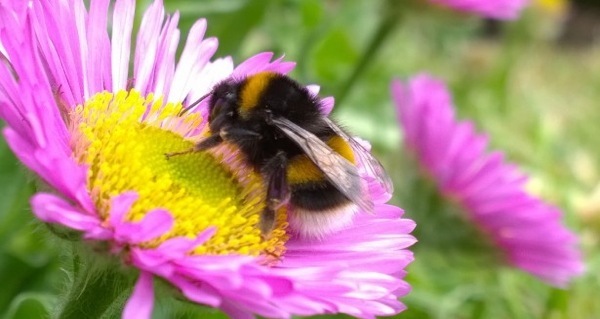 Unfortunately, bumblebees are on the brink of extinction. Mother Jones reports that they are hit especially hard by the insecticides that many U.S. farms use to manage their crops. While the Obama administration placed bumblebees on the endangered species list, which would have afforded them certain protections, President Donald Trump has frozen that regulation from taking effect, potentially forever. Next, check out the bee-decapitating Asian giant hornet that is the stuff of nightmares, before peering inside the life of a solitary bee.